The next phase in the licensing process is mandatory attendance at an intensive 18-hour training session. All successful examinees are informed of the scheduled date for the training. This is usually held on a weekend in late January through mid-February. In this session you will be instructed on all aspects of a guides’ duties. Battlefield Tour Demonstration – Meet GTC Coach at the Group Entrance Chris Rebmann, LBG with other guides in visitor roles. Immediately following the training weekend, the oral examination process will begin. 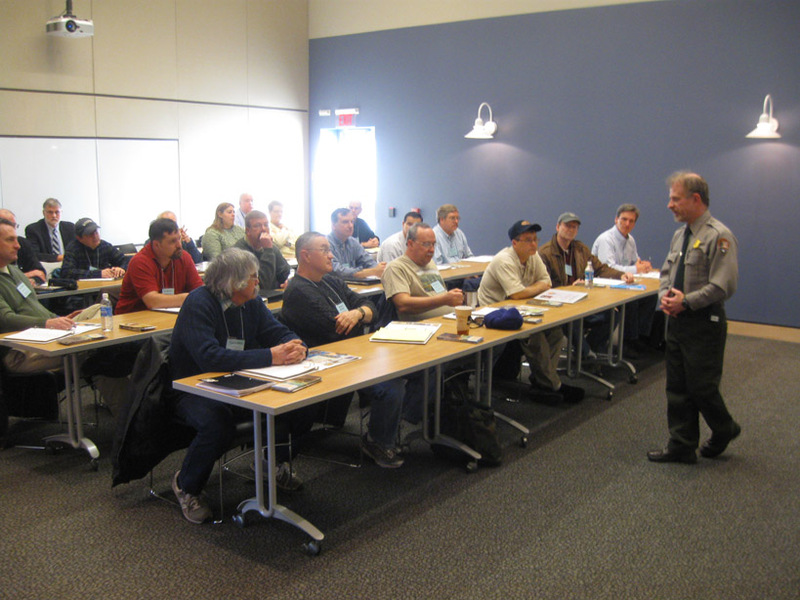 Many veteran guides consider the oral exam to be the toughest part of the entire licensing process. The 2006 testing cycle saw 21 individuals score high enough to be invited to training weekend and enter the oral examination process. Of those 21 only 9 individuals successfully completed the process and received a guide license. Guide-candidates are scheduled for their exam based on their score on the written component. Perhaps four or five will be tested in the early spring immediately following the traning weekend. Exams will stop during the busy spring and summer guiding seasons and will resume in the fall. All candidates must successfully pass the oral examination which consists of a two-hour car tour that you give to a ranger and an LBG playing the role of visitors. You provide a vehicle and you drive. On the appointed day you arrive at the Visitor Center and report into the desk where the examiners will be called. Prior to arriving you should work out a good tour which covers all possible aspects of the battle within a two-hour time frame (not much shorter and absolutely not much over.) The ability to do a concise tour in a specified time frame is crucial to success. The oral is treated as any normal tour of the field. The examiners play the role of visitors and will tell you where they are from. You are expected to weave that knowledge into your interpretation, to personalize the tour to the party. You will be evaluated on how successfully you are able to do that. The examiners will question you throughout the tour in order to test your knowledge and your ability to weave those answers into your narration. They will be looking for ability to present factually correct information coherently, for evidence of a common theme, for good introductions and conclusions, nice transitions day to day and site to site, an ability to keep your party spatially oriented, the ability to present at an appropriate level for your clients, your rapport with people, your tonal quality, the handling of tour mechanics, appearance, and driving ability, appropriateness of stops. All of these and much more, will be looked at by the examiners. To say the least it is a nerve wracking experience that once endured, few wish to do again. Throughout the trip the guide and ranger examiners will busily be taking notes, recording their observations, and marking your score on a numeric scale. Sometimes you may be asked to return to the Visitor Center early. If this happens, you generally did something so wrong it needs to be corrected. If you do make it the whole way around, and most tours are allowed to continue to the end just to see it, then you will be asked to give the examiners about a half hour to compare notes and talk about what they saw. This half hour may seem like the longest time you’ve ever waited. You will be taken into an office and the three parties: guide, ranger, and you, will talk about the exam. You will be critiqued. You will be told what you did right, what you did wrong, and what areas you need to work on. You will be told at this time if you passed the exam or if the examiners wish you to take the test again. A good many of the guides now licensed failed the oral exam the first time through. If you failed, you will be told exactly why and how to fix it. You will be allowed to take as much time as necessary to correct the problems, asked to take some more practice runs around the field and perhaps even hook up with a guide willing to help you work on the rough spots. You will be provided with written comments from the examiners after the initial oral exam. At your convenience, you will be asked to phone in and let them know when you are ready an you will be rescheduled, going through the whole process again. In any given testing year about one-third of the folks who successfully pass the written test, fail both oral exams. If you fail the oral twice you must repeat the entire process. You must wait until the written test is offered again, take and pass it, go through the training session, then take the oral. Some do so and again fail, some do so and finally make it. Some simply give up. If your examiners say “congratulations, you’ve passed!” you can breathe a deep sigh of relief. You’re almost there. At this point you will be told you will receive an evaluation in the mail as you probably still have weak points to work on in your program. At the time you are doing so someone at the park will probably check out your references and paperwork to make sure all is in order. You will receive a written form of the license which must be signed along with the statement of rules and regulations which your signature indicates you will abide by. Included with this must be payment of your annual licensing fee, ranging anywhere from $75 to $360 depending on your category. The superintendent will sign and issue your official license which is a card you must carry while on tour. You need to acquire a uniform from the list of prescribed items. You need to visit the Visitor Center. in order to get some guide patches for your uniform. Once this is done, and the expense to do so may run anywhere from $200 up to $500 to get this far, you are ready to show up one morning prepared to conduct your first tour! !